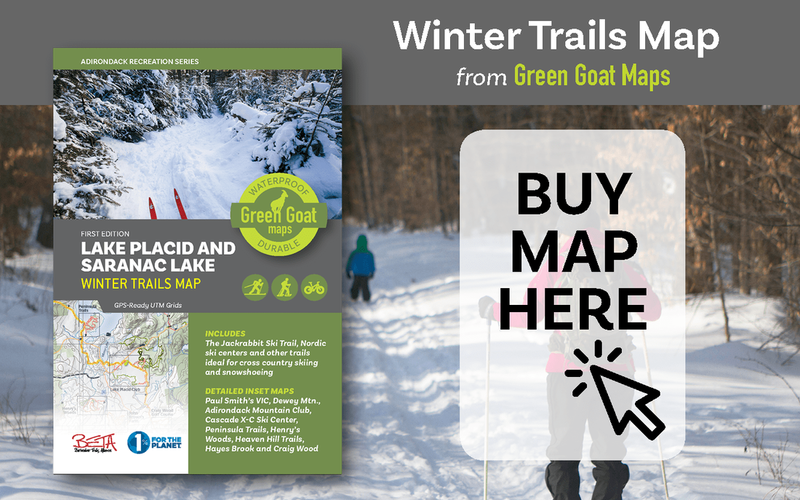 For the 2017-18 ski season, Barkeater Trails Alliance (BETA) worked with Green Goat Maps, based in Saranac Lake, to develop a new winter trails map that features the entire Jackrabbit Ski Trail and many other ski and snowshoe trails in the surrounding region. The map can be purchased online by clicking the photo at right, or you can find it in many local retailers such as High Peaks Cyclery, Human Power Planet Earth, Bookstore Plus, The Mountaineer, and others. For a full description of the main 25-mile Jackrabbit Ski Trail route between Keene, Lake Placid and Saranac Lake, click the links below. The description and inset map for the 9-mile section near Paul Smiths is listed below. While not yet connected to the rest of the Jackrabbit Trail (connection possible by skiing the railroad for 6 mi. to and through Saranac Lake), this section offers some pleasant, easy skiing with several intermediate starting points. In Lake Clear, the trail starts on Rt. 30, 0.5 mi, north of the junction with Rt. 186 and directly across from the Lake Clear Elementary School. A few yards in from the highway, the trail turns sharp left and follows a main electric transmission line. It crosses first a usually plowed gravel road that leads right to Charlie's Inn and then a second plowed road that is the access to the Town of Harrietstown Transfer Station. Neither of these are good starting points due to a lack of parking. Past the second plowed road, the trail follows the old road bed of the Paul Smiths Electric Railroad through extensive wetlands to a junction at 2.8 mi. Here the Jackrabbit Trail leaves the power line as it swings sharp right onto a wide lumber road which is followed to a gravel pit at 4.2 mi. Continuing past the gravel pit, the trail soon swings sharp right off the wide road onto a narrow trail that leads to an open area known as Montou Clearing at 5. 0 mi. Now on a narrow old road, the trail reaches and crosses Rt. 86 at 5.8 mi. Past Rt. 86, the trail climbs briefly before descending and then reaching Jones Pond Rd. (County Rt. 31) at 6.6 mi. Crossing the road, the trail has a short, steep climb to some gently rolling terrain that leads to White Pine Rd. at 7.5 mi. at a point 200 yds north of Rt. 86. Crossing the road the trail soon bears left and drops down to join the Red Dot Trail at a bridge over the channel between Little Osgood and Church ponds. Climbing to a four-way jct. at 8.0 mi. the Jackrabbit Trail goes straight to another four-way jct. at 8.3 mi. Turning right, the trail dips and then climbs to an open field at the west end of Osgood Pond. Going straight across the field the trail continues through a pine grove to Rt, 30 with the Paul Smith's VIC a few yards further after crossing the highway. The VIC offers parking, rest room facilities and warming area plus their own 20 km. of groomed cross-country trails for which there is a trail fee. The VIC is located on Rt. 30 1.0 mi north of the junction with Rt. 86 at Paul Smiths.